I surprised my boyfriend with this flight for his birthday a few weeks ago, and I am soooooo glad I did! It was the most amazing experience we had on our trip to Alaska! We were concerned that the weather would be an issue, but we ended up having what our pilot called a "5% day", meaning there were zero clouds in the sky and very little wind... We were able to get right up to the mountains with the sun shining and experience the most spectacular views!! Everyone at K2 Aviation was amazing and so friendly and welcoming. Our pilot, Chris, was super knowledgeable and made us feel safe the entire time, and he taught us so much about the landscape and local history. if you have the chance to take one of the flights that K2 offers, DO IT!!!! View was beyond amazing! Being able to communicate with the pilot was an unexpected feature of this highlight of my 14 day trip.Unfortunately he couldn't land on the Glacier as planned, but gave us extra air time,plus were refunded some of the cost of the tour. 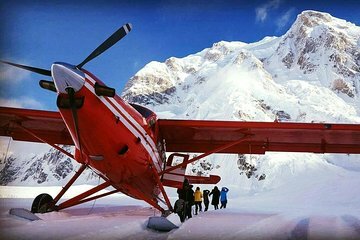 Don't hesitate, treat yourself to this up close and personal experience with Denali. Wonderful experience, Great to be able to see Denali from the air since don't hike anymore. We had the great fortune on scheduling our excursion on what the K2 Aviation people said was the best day of 2017, so far. The mountain was in full view and the winds were subdued so we were able to circle the mountain and see it and the surrounding peaks in glorious sunshine. We were able to get within 1000 feet of the mountain so it felt like you could reach out and touch it. The glaciers were amazing. We were shown the routes various climbers used to summit the mountain. This was one of those magical tours that we will remember forever. Mt. Denali by air was fabulous. The air was was so crisp and the view beautiful. Our pilot, Josh, really knew his stuff. We did a narrated bus tour of Denali the next day. Felt we got did it right.